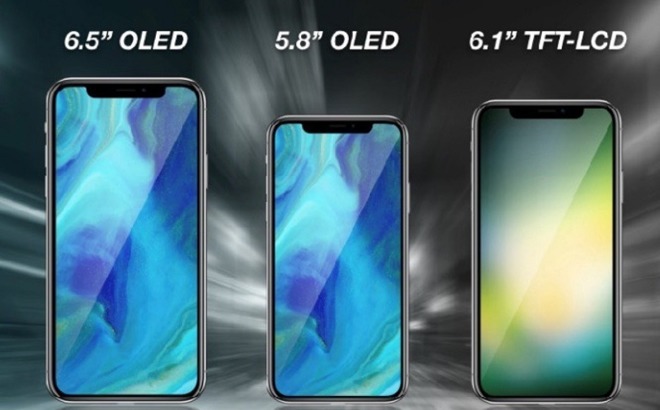 According to the report authored by analyst Amit Daryanani and obtained by AppleInsider, in 2018 Apple will release one 6.1-inch full-screen LCD Model with 3D sensing and two OLED models. RBC also expects that iPhone production will include 80-90 million units in the second half of 2018, and of that production, the LCD model will consist of about half. While that would represent a decline from the more than 100 million expectation of the iPhone 8/X cycle from earlier this year, RBC attributed the decline in orders from parts suppliers mostly to "supply chain partners managing inventory levels more diligently." In addition, Daryanani writes, Apple is insisting on "incrementally tighter cost management," which RBC is attributing to an increasing amount of features, like Face ID possibly making it to the entire line. Daryanani expects a "regular production ramp schedule," which should begin in May. In 2017, the iPhone 8 began construction in May, with the iPhone X not seeing large quantities off the production line until September and early October. These predictions are roughly in line with previous supply chain-derived expectations about the next iPhone cycle, including a Digitimes report in March that also predicted three new iPhone models, including an LCD product that would include about 50 percent of the production. Ming-Chi Kuo of KGI Securities had predicted three new iPhones in late 2018 in November 2017, and maintained that prediction earlier this year. The upside scenario, according to Daryanani, would entail faster-than-anticipated growth in Apple's services, leading to gross margins over 40 percent, while the downside would involve Apple losing market share in both smartphones and tablets. "We believe AAPL's current stock price creates an attractive entry point for investors to benefit from its ability to generate revenue and EPS growth in FY18," Daryanani said in the report, also calling Apple's valuation "materially sub-par to what we anticipate is its long-term revenue and EPS potential." Daryanani attributes the optimism to several things: The ramping up of the iPhone release, the refresh cycle of Macs and iPads, the potential launch of a new Apple streaming service or any other major product line, and the passage late last year of tax reform legislation, which Tim Cook said in January will cause Apple to repatriate $350 billion in cash back to the U.S.
RBC Capital maintained its Apple price target of $203 citing a "host of tailwinds - capital allocation, services growth, gross-margin upside and attractive valuation" with an upside scenario of $230 and a downside of $140. Apple's stock opened Monday at $169.88 on the NASDAQ. 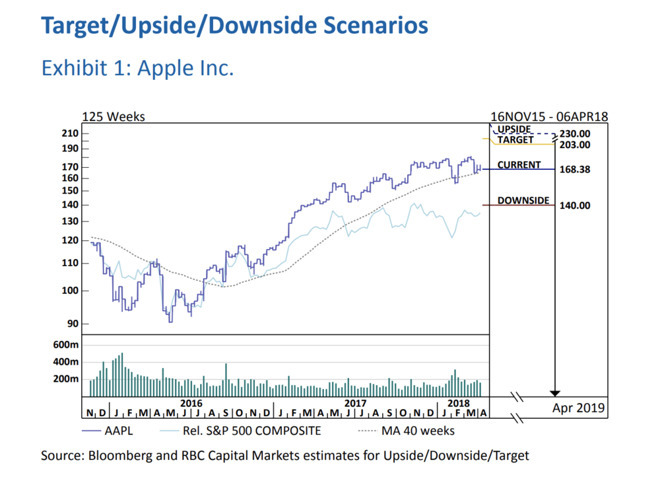 The firm cut its price target on Apple from $205 to $200 in February, ahead of Apple's quarterly earnings. Daryanani's predictions are based on "supply chain checks" and supplier visits.